The most beautiful campsite on the Nantes Brest Canal - Open from 30/4/19! 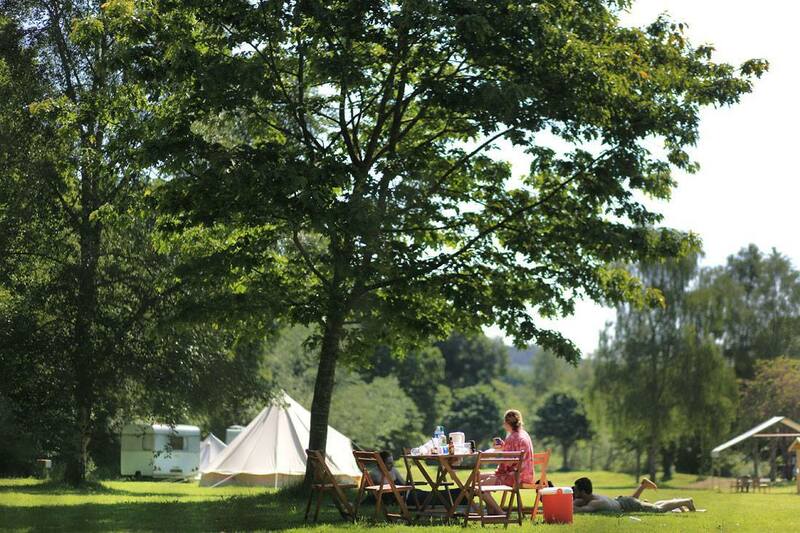 Set on the bank of the Nantes-Brest canal, Gouarec campsite is one of the prettiest in Brittany. Not only is it right on the canal towpath, but also at the junction with the V6 cyclepath (see map) – both being part of the Velodyssee/Eurovelo 1 cycle route and has been the base for our French cycling holiday company - Breton Bikes for over 28 years (when it was known as Camping Tost Aven). Our prices are simple - just 6€ per adult 3€ per child (under 18) per night. It doesn't matter whether you use electricity, or have five showers a day, arrive with a tiny tent or a 40' motorhome - the price is the same. The campsite itself is large (8 acres for only 100 emplacements) and grassy with a real feeling of an old-fashioned 'campsite' rather than a parking lot for mobile-homes and chalets. To this end we have installed vintage caravans, canvas tents and shepherd's huts for accommodation a little out of the ordinary and the Lockhouse by the campsite costs just 15€ per person. But all leaves acres of space for your own tent, caravan or camping-car. Gouarec itself is a small Breton village which has all you might need – three restaurants, a small supermarket, baker, banks, garage, post-office and large swimming-pool – in fact all you need for your holiday and all within 500m of the campsite – you really don't need a car. In the immediate area you'll find lots to do, and for those wanting to explore wider afield the fact that Gouarec is the geographical centre of Brittany means that almost every part of the region is within a 90 minute drive.